Rustic Western tooled paisley Western and Southwestern Bedding Set. 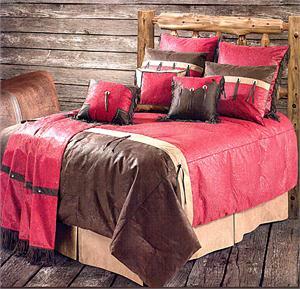 This is Micro-Suede comforter set with alot of western style right down to the conchos set on the comforter. Sets include Comforter, Dust Ruffle, Pillow Sham(s), and Tan Framed Square Pillow. Chocolate, Red, and Tan micro-suede comforter set accented with western style conchos. The dust ruffle is Tan with a tooled paisley pattern. Pillow shams are chocolate, red and tan micro-suede and also accented with western conchos. This set includes a bonus cushion pillow with rustic red in the center and framed with tan. Pictured not included: Red Faux Tolled Leather Euro Sham(s), Red and Chocolate Yoke Cushion Pillow, Red with Chocolate Cornered Cushoin Pillow, or the Red Faux Tooled Throw Blanket.